WASHINGTON (CNN) -- Six life insurance companies have qualified to receive billions of dollars in bailout money under the government's Troubled Asset Relief Program, according to the U.S. Treasury Department. 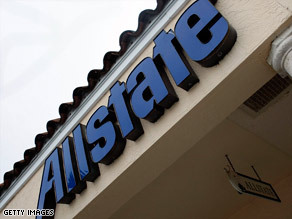 Allstate is one of six life insurance companies who are qualified to receive TARP money. Treasury Department spokesman Andrew Williams said Allstate, Ameriprise Financial, Hartford Financial Services Group Inc., Lincoln National Corp., Principal Financial and Prudential Financial Inc. have qualified for TARP money. "These life insurers met the requirements for the Capital Purchase Program because of their bank holding company status and each applied for CPP capital investments by the deadline of November 14, 2008," Williams said. Williams also said other financial institutions in the Capital Purchase Program "will be reviewed and funded as appropriate on a rolling basis." In April, about $135 billion remained from the original $700 billion allocated for the bailout last October. No current figures were immediately available. No funding amounts were announced by the Treasury Department, but Hartford said it had been preliminarily approved for $3.4 billion. "We are pleased that we received preliminary approval to participate in (the) Treasury's Capital Purchase Program," said Ramani Ayer, chairman and chief executive officer of Hartford. "These funds would further fortify our capital resources and provide us with additional financial flexibility during one of the most volatile market climates in our nation's history." Investors have been increasingly worried about the health of life insurers, which have been hit hard by worries about capital requirements and growing losses. A number of insurers that are also bank holding companies or thrifts have been eligible for funds from TARP since last fall. Last year, the Office of Thrift Supervision approved applications from Hartford and Lincoln to become bank holding companies, because of their planned bank purchases. Philadelphia, Pennsylvania-based Lincoln is buying Newton County Loan & Savings FSB in Goodland, Indiana. Hartford, based in Hartford, Connecticut, is buying Federal Trust Bank in Sanford, Florida.